The Mt. Victory CIC is helping with the effort to renovate & improve the Mount Victory Village Park in conjunction with the village govt. Please consider donating to this worthy effort to upgrade your park. Every dollar counts and no donation is too small. Coming in July / August upgrades to concession stand! — New Mt. Victory Village Park designed, fabricated by Dennis Copp and installed by CIC volunteers this fall. Funded by a generous grant from the Hardin Co. Community Foundation. 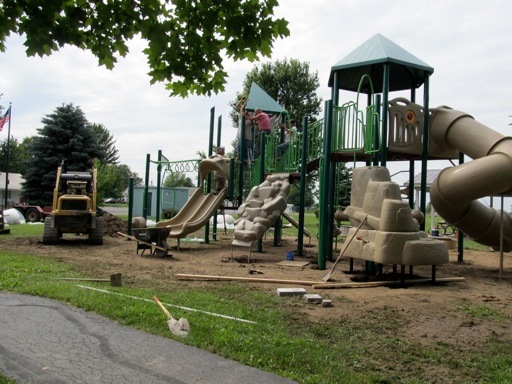 –Scott’s of Marysville has donated mulch needed for the entire playground. Thank you Scott’s! –Trees in playground were assessed and some removed as needed. The wood from these failing trees will be used as art of the natural tot playground design. — Plans underway to resurface and refurbish the walking path that gets much daily use. BE A FRIEND OF THE PARK AND DONATE! 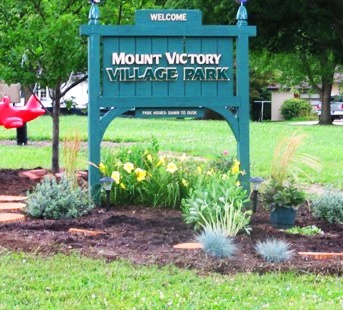 Be Friend of the Park today and donate toward the renovation and upgrade of Mount Victory Village Park. Donate here online at any level OR donate whatever amount you like. To donate offline with a check, contacting CIC President, Peggy Harrison at 937-354-3334. Remember your donation toward the park effort is tax deductible – CIC is a 501(c)3. Your donation means you are a Friend of the Park and helping to improve YOUR park here in Mt. Victory! And THANK YOU for your donation – every dollar counts. Would you or your group like to get involved in raising money for the park renovation?